Stratford Town striker Richard Gregory is the subject of a seven-day approach from Brakes. 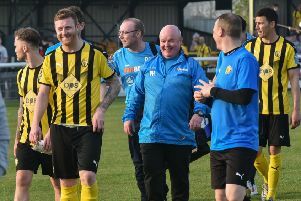 Leamington boss Paul Holleran is hopeful of bolstering his striking options ahead of tomorrow’s trip to Frome after putting in a seven-day approach for Stratford striker Richard Gregory. Town took the unusual step of announcing the approach last Saturday, admitting that it would be difficult to keep hold of their leading goalscorer. And while Holleran said seven-day approaches are a regular occurrence in the Southern League, he is thought to be confident of pushing through a move when he speaks to Gregory later today. “Seven-day approaches go in at lots of clubs - we’ve recently had two go in for our players,” said Holleran. “We need to add to our attacking options with someone in the number nine role and Richard has a great eye for goal and is the right age. Holleran knows persuading the 28-year-old to leave the DCS Stadium will be no easy task, but he says the prospect of joining the league leaders could be one that appeals. “He likes the club and likes the manager there and I know Richard a little bit and he’s a football lad. If Gregory does make the switch he will join loan signing Dan Preston who was signed in midweek as cover for Jamie Hood. The AFC Telford centre-back has joined until January with Hood expected to be out for two to three weeks with the knee injury he picked up in the defeat to Hitchin on Saturday. Holleran admitted the two Donnelly brothers had “done a job on us” in the 2-1 loss, with Brett Donnelly scoring twice before being dismissed. However, he was delighted with the response in midweek, with goals from Ahemd Obeng and Courtney Baker-Richardson earning a 2-0 win at Dunstable Town to take Brakes six points clear at the top of the Southern Premier League table. “It was a good solid away performance and as the game opened up we should have won by more,” he said. n Jack Edwards misses out tomorrow as he starts a two-match suspension.